Rosetta spacecraft obtained this four-image NAVCAM mosaic of Comet 67P/Churyumov-Gerasimenko, with images taken on Sept. 19, 2014, when it was 18 miles (28.6 km) from the comet. Europe's Rosetta spacecraft has returned some of the most detailed images yet of the comet it caught last month after a decade-long chase through deep space. 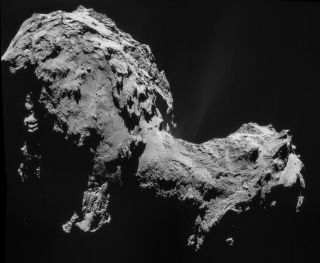 Rosetta snapped the four new comet photos — which mission scientists stitched into a single mosaic — on Sept. 19, at a distance of 17.7 miles (28.6 kilometers) from the center of Comet 67P/Churyumov-Gerasimenko. The mosaic shows ridges on 67P's "neck" and many cliffs and boulders scattered across the comet's surface. Some of the photos overlap, so the same comet features can be seen in multiple images. Rosetta launched in March 2004 and finally caught up to 67P on Aug. 6 of this year, thus becoming the first spacecraft ever to orbit a comet. The probe has been taking photos and measurements of 67P ever since, allowing astronomers to construct the first map of the 2.5-mile-long (4 km) celestial object. European Space Agency (ESA) researchers used a program called Microsoft ICE to stitch the four new Rosetta photos together. A few areas on the left needed exposure adjustments, and the whole image's contrast was enhanced a little, ESA officials said. Rosetta spacecraft produced this four-image montage of comet 67P/C-G, with images taken on Sept. 19, 2014. Black borders separate the images, and there is some overlap. Achieving orbit around 67P was a cosmic first, and the Rosetta team plans to make some more history soon. The mission plan calls for Rosetta to drop a lander called Philae down onto the comet on Nov. 11. Philae will land on the smaller of 67P's two lobes to study the comet's surface and analyze its composition and atmosphere. Philae also has a drill, which it will use to take samples. ESA officials expect that Rosetta will fly with and study the comet until December 2015. They hope the mission provides insight into how comets change as they approach the sun.